Rustic 2BR Hiwassee River Cabin-Near Fly Fishing! Escape from the hustle and bustle of everyday life with this 2-bedroom, 1-bathroom Reliance vacation rental cabin, that sleeps up to 6. 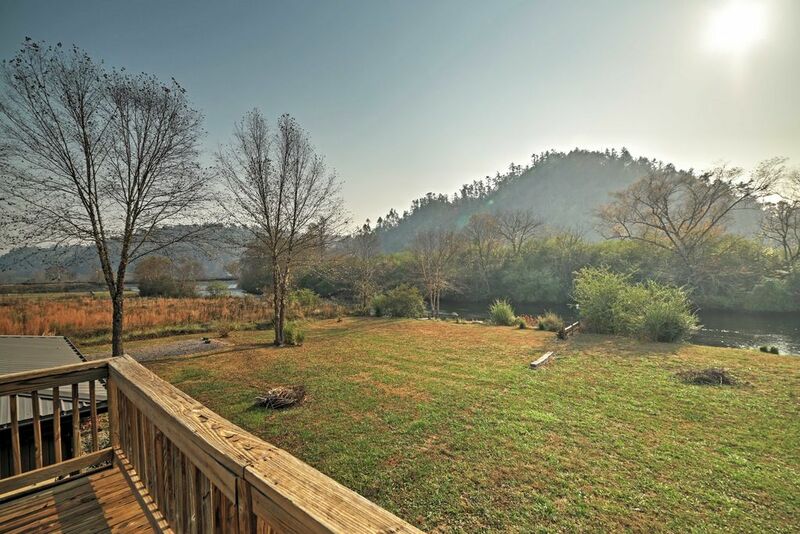 With simple furnishings and an unbeatable location right along the Hiwassee River, you'll enjoy a quiet getaway and a feeling of seclusion that can't be beat! Enjoy direct access to the river for fly fishing, paddle boarding, rafting and swimming, along with a great location near the Cherokee National Forest for endless hiking and biking adventures. Whether you wake up early to go fly fishing or to sip your morning coffee on the deck overlooking the gorgeous river and mountains, you'll love every morning at your cozy cabin. During the day, cast your line out in hopes of catching some trout or take advantage of the expansive yard, where you can play a game of catch with your furry friend or travel companions. With only a few other cabins in the area, you'll easily be able to obtain the peace and quiet you've been searching for. Situated directly on Hiwassee River and surrounded by majestic sights, this fantastic cabin encompasses 575 square feet of rustic living space for you to come home to after your daily adventures. The no-frills interior is furnished with tasteful decor, comfy furniture, and handsome hardwood floors. All of the amenities needed for a comfortable stay are here, including air conditioning, central heating, and soft linens. After an active day, you'll appreciate being able to retreat to your comfortable cabin to prepare a home-cooked meal in the fully equipped kitchen. Enjoy your dish with a refreshing beverage on the deck while you watch a beautiful sunset. Just a few steps from the cabin, you'll be able to participate in an abundance of fun water activities in Hiwassee River, including tubing, paddle boarding, rafting, fishing, and swimming. If you feel like venturing further, explore Tennessee's natural beauty on one of the many stunning hiking trails at Cherokee National Forest. For a mouthwatering meal, visit Flip-Flop burgers or grab some tasty ingredients at Hall's Grocery. However you choose to spend your time in Reliance, you'll quickly fall in love with this spectacular cabin, making it your mountain vacation destination for years to come! - Secluded location on the magnificent Hiwassee River- you won't have to travel far for swimming, tubing, world class fly fishing and paddle boarding! Wasn’t brand new but nice little cabin on the river and nice patio. Where to start? I normally do not give bad reviews but, I want to save someone else the headache and $$ we wasted. This place was nothing as describe. It was on the water. However, the yard looked as though it was just mowed after a years worth of growth with tall grass and limbs right in the middle. I didn't feel safe for kids to be out there and we couldn't get to the water to even fish due to the overgrown brush. The air conditioner didn't cool at all. The water smelled like metal and 3 days later I still smell it as I rinse my hair. I didn't let my child use the shower. The sattelite and Internet did not work. It says it sleeps 6 but there were no pillows or blankets for the living room futon. There was no fire pit or grill area which would seem like a necessity at a place like this. This place is way over priced for what you get. We would prefer a tent next time. We left one night early because we were miserable. Thank you for taking the time to let us know about the issues that arose during your trip. We are sorry your stay fell short of expectations, and we assure you we’ll do everything we can to make sure the issue doesn’t recur. We understand that not having air conditioning negatively impacted your stay! The owner did call in emergency maintenance as soon as the issue was brought to light, but unfortunately the air conditioning was not able to be fixed immediately. Alternate accommodation in a nearby comparable property was offered, however this offer was not accepted despite the owner’s best efforts to remedy the situation. The owner strives to keep the property well maintained, as the yard was mowed the day prior to check-in. The wireless internet is confirmed to be accessible at the property, however we apologize that it was unable to be accessed during your stay. This cabin is designed for a more rustic experience and the owner strives to provide the best possible service for his guests. Thank you again for your feedback!